This is entry #3 of my 52 Project 2012: Foundational Electronic Components Crash Course series. An inductor is basically just a coil of wire. It behaves differently from a regular wire because it is specifically coiled (often around a special material in the center), and this allows the electrical current to build up a magnetic field. This magnetic field affects the flow of current through the inductor such that it resists changes to the energy flowing through it. How does an inductor work? Inductors, like resistors and capacitors, have two terminals. Remember that resistors reduce the energy flowing through them by converting some into heat, and capacitors store the energy flowing into them with metal plates and special dielectric materials. Inductors, by contrast, resist any change in the flow of energy through them. For an analogy, consider a flywheel. If the flywheel is not spinning, it takes effort to make it spin. If it’s already spinning quickly, it takes effort to make it stop. But whether the flywheel is stopped or spinning freely, it only takes effort to change its rotational speed (assuming a frictionless system, anyway). A flywheel stores rotational energy using momentum. Similarly, an inductor stores electrical energy in a magnetic field. Using the flywheel as an analogy, the inductor is “spinning” when it has built up a magnetic field, and it is “stopped” when there is no field. When energy flows through the inductor, most of that energy goes into the creation of the magnetic field until it is fully charged. Once this happens, energy flows easily through the inductor as though it were a regular wire. Then, when the energy supply is cut off, the charged magnetic field is gradually converted back into electrical energy until the magnetic field is entirely gone. A resistor reduces the flow of energy by converting it into heat. The magnetic field is able to build up in an inductor because of the placement, coil spacing, cross-section size, and central material used in the inductor. Inductance increases with the number of coils, as well as with the use of certain materials (such as iron). Inductors in electronic circuits are often very, very small. However, sometimes, they are much larger than you might expect. Traffic signals use large wire inductors built into the road. The large metal chassis of a car sitting over the wire loops change the inductance value, and this change is detected by the traffic signal system. Inductance is measured in henries, or sometimes in millihenries or nanohenries. One henry is defined as a one-amp-per-second rate of change of current that generates one volt. A little complex, yes, but think of it this way: more inductance means a stronger magnetic field will be generated. Inductors have a maximum current rating, which is the maximum safe current the inductor can take without any potential damage. Inductors also have a tolerance rating, specified as a percentage. The tolerance indicates by how much the actual performance may differ from the rated performance (similar to resistors and capacitors). This is entry #1 of my 52 Project 2012: Foundational Electronic Components Crash Course series. 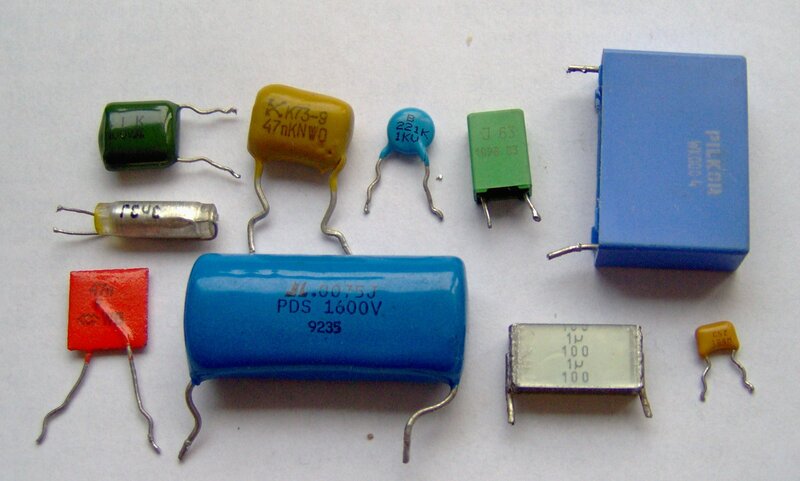 A resistor is one of the simplest types of electronic components in existence. It simply takes some amount of power in one end, and lets some smaller amount of power out the other end. Fundamentally, a resistor is very simple. It is a single linear component that is made out of a specially calibrated quantity of material, such as ceramic, that lets current through, but not as efficiently as a plain wire does. What about the extra power though? It can’t just disappear, obviously. If more goes in one end than comes out the other end, something must be happening in the middle. That something is that the excess electrical power is converted by the resistive material into heat. You may have noticed that many electronic devices get warm or even extremely hot to the touch when they are turned on. This happens because electronic components inside the devices are not 100% efficient, and the inefficient power usage results in heat. Sometimes this is an intended part of the circuit design, as is the case with resistors. Resistors are used to limit the quantity of power that can go into any particular part of the circuit. The heat, if there is any, is an expected byproduct inherent in the design. However, other components often exhibit this heat byproduct even though we’d prefer them not to, and this occurs simply because component designs cannot escape the 2nd Law of Thermodynamics. There is always some inefficiency. One interesting example of this effect is the eye on an electric stove, which is usually a coiled up piece of metal. This metal is nothing more than a giant resistor. When you turn the eye on, a bunch of power is pushed through this resistor, and the effect is a whole lot of heat dissipation. Resistors are rated in overall power dissipation (given in watts), resistance (given in ohms), and tolerance (given as a percentage). The power dissipation is the maximum power that can be safely dissipated by the resistor before there is danger of heat damage to the material. The resistance controls what fraction of the power will be removed and converted into heat. The tolerance is the margin of error of the resistance rating (often 5% or 10% in either direction). In general, resistors are very inexpensive, unless they (1) have a very high power dissipation and/or (2) are made with an extremely precise tolerance. 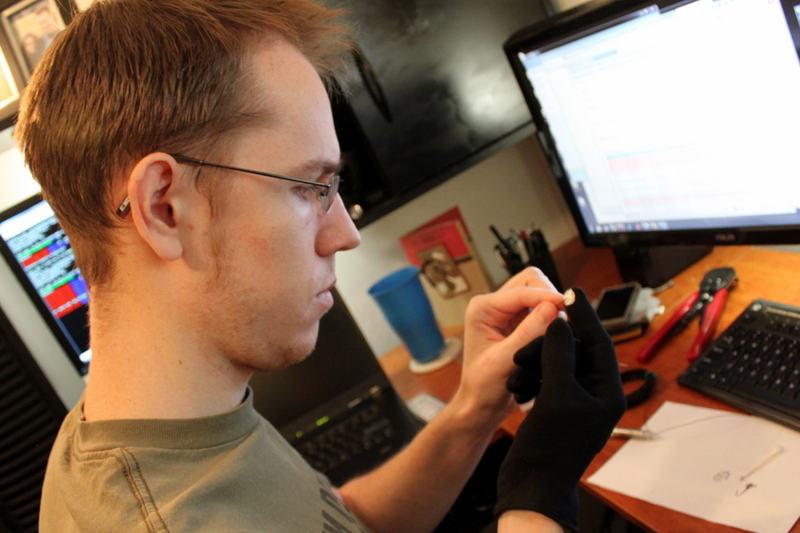 Resistors are one of the absolute cheapest components you can buy. Common small resistors are rated at 1/8 watt, 1/4 watt, or 1/2 watt, and anywhere from 1 ohm to many millions of ohms. 1/4 watt is not a whole lot of power, but it’s often more than enough for any given part of a small circuit. What happens to the voltage and current? Remember that power is made up of voltage and current. If you recall, current in a circuit remains constant throughout all components connected in series, so we know that resistors don’t reduce current. Since we know that they reduce power, that leaves only one option: they reduce the voltage. But by how much, exactly? Mathematically, it is easy to see that if current (I) remains constant, then if resistance (R) increases, voltage (E) must decrease to maintain the validity of the equation. This is entry #0 of my 52 Project 2012: Foundational Electronic Components Crash Course series. Since pretty much every one of these explanations of electronic components will refer to “voltage” and/or “current” as part of the description, it is important to start by having a good working understanding of what those two things are. 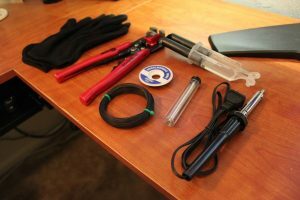 Since this is a bonus article of sorts, I’ll be (a bit) lazy and directly point you to this brilliantly simple article on voltage and current, by John Hughes of The Electronics Club, if you’d like a simple technical overview with diagrams. Don’t go away though, because I’ll still give my own simple explanation here. Although it doesn’t paint a comprehensive picture of everything that’s going on, my favorite way to think about these two critical parts of electronic theory simply is by using a plumbing analogy. Consider a metal pipe with water running through it. The size of the pipe is voltage, and the flow rate of the water is current. Voltage is measured in volts, and current is measured in amperes, or just amps. If you push more water through the same pipe, the voltage remains the same, but the current increases. If you push the same water through a larger pipe, the current is the same, but the voltage increases. This illustration helps explain the rule of thumb that “It’s volts that jolts, but mills that kills.” (Mills in this case refers to milliamps, a different unit for measuring current.) This is why you can have a million volts running through your body, and if the current is tiny enough, you will be completely unharmed. Or, conversely, you can have only a few volts running through your body, and if the current is large enough, it can still kill you. Returning to the plumbing analogy, you can go swimming in a large body of water (a.k.a. “high voltage”), but as long as that water isn’t going anywhere or is barely moving (a.k.a. “low current”), you’ll be fine. Or, you can push a very small stream of water (a.k.a. “low voltage”) through a microscopic hole at extremely high pressure (a.k.a. “high current”) and use the stream to cut through solid objects. The overall power all depends on how much and how fast. It is useful to understand voltage and current without an analogy as well, so here’s my best shot at a short explanation. Voltage in a circuit is measured as the difference in electrical potential between two points. Wires by themselves typically don’t affect the electrical potential, but other electrical components do. The difference in electrical potential between the positive and negative terminals of a 9V battery is 9V (assuming the battery is charged). Electrical components “use up” voltage. Current in a circuit is measured as the rate of electron flow between two points. Current is constant throughout all components connected in series, since electrons that go into a component have to go out as well. Electrical components do not “use up” current like they do to voltage. There are actually two different types of current in electrical circuits. One is direct current (DC), and the other is alternating current (AC). There is a lot that can be said to explain the difference, but I’ll try to keep it simple. Direct current flows constantly in one direction. The voltage between two points in a circuit powered by direct current is constant (barring some modification by the circuit). Batteries produce this kind of current; it is simple to measure and generally easy to work with. Alternating current moves backward and forward rapidly at a certain frequency. The voltage between two points in a circuit powered by alternating current varies in a waveform pattern, alternating between positive and negative peaks and typically measured using a root-mean-square (RMS) calculation. This is the kind of current that comes from the outlets in your house. Alternating current is generally much more efficient to transmit over long distances, such as from the power company to your home, and it is easy to convert into different forms using a transformer. Since it’s directly related, what about power? You may know that typical US households run on 110V or 120V systems. But power is usually measured in watts or kilowatts, right? What’s a watt, exactly? Power is just voltage and current put together. Last year, I feebly attempted a 365 project that involved simple drawings each day using Adobe Ideas on my brand new iPad (given to me by my family for Christmas of 2010). I got halfway through February and ran out of motivation, or inspiration, or both. It wasn’t an inherently bad idea, but that kind of art is not my best creative outlet. I have to really try if I want to draw anything decent. Now, if my goal had been to learn how to be a better artist, it probably would have been great—but that wasn’t my goal. I was just trying to do a 365 project for fun, and even that was a spur-of-the-moment decision right at the beginning of the year. Part of the problem was also that doing something potentially time-consuming every day was too hard to work into my schedule. So this time, I decided that I wanted to do something more motivating, slightly less ambitious, and far more aligned with my passions. For each week of 2012, I will write in my own words an explanation of exactly how one specific type of electronic component or module works. This will be weekly instead of daily—hence the “52 Project” name—–which will be easier to manage. Instead of art, it will be about electronics, which is much more interesting to me. Instead of drawing, it will be done through research and writing, which comes much more easily to me. And finally, instead of having a collection of drawings at the end, I will have learned (and shared) a great deal of very interesting and relevant information along the way. I had some informal training by my dad (who has an EE degree from UCSB) during my time exploring electronics kits as a hobby when I was younger, and a bit of self-taught knowledge when I got my Amateur Radio license a couple of years later, but the extent of my formal training in the electronics arena was confined to three semesters of physics in college. Most of the material in those classes covered other topics. This means I have detailed knowledge of almost nothing, even though I’ve built dozens of electronics kits and I work with many components on a regular basis. I know just enough to be dangerous, as they say. Well, enough of that. I don’t want to be dangerously ignorant. I want to know enough to teach this stuff to somebody else. So, I figure that if I can comprehend something enough to explain what it does and how it works in a couple of paragraphs, that will be a pretty good indicator that I’ve grasped the concept. And, quite possibly, I will be much better prepared to efficiently build stuff like the Keyglove project. More to come, obviously. I will post the rest of the list as soon as I come up with it. I will also turn each item into a link as I write that post. It’s been a full two weeks since my last post, which is the largest gap I’ve had since I started trying to write weekly at the beginning of January. The main reason for this is that I’ve been really busy, and not just with normal “life” stuff, but also with a separate project that I’ve been writing about on the project-specific blog over at keyglove.net. The project, as you can probably tell from the website name, is called Keyglove, and it’s a one-handed input device. I won’t say more about it than that here, since all the info you could possibly want is on the website. Check it out if you want to. What I did want to say though is that the hardware I’m using to control the glove (an Arduino board) is absolutely incredible. 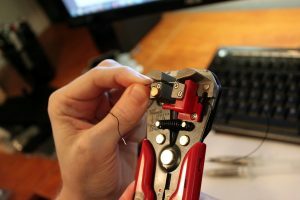 In the past, I haven’t messed around with hardware very much, although I understand fundamental concepts in electronics and have built many kits that require soldering and lots of very tiny parts. I really enjoyed building those kits, too. But I am a programmer at heart, so most of my creativity comes out in code. The kits were a lot of fun, but since I didn’t design them, I didn’t have the same kind of “joy of expression,” so to speak, even though I loved building them. 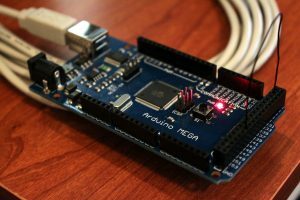 Along comes the Arduino board—or, I should say, I randomly discovered its existence—and all of a sudden I have a very inexpensive microcontroller that I can program however I want with a single USB cable and an simple open-source C++ IDE. It is the perfect tool for me to use my love of programming to create something physical instead of just digital. The Keyglove project mentioned above is what I was inspired to build after thinking on-and-off for years about what I would want to use as an input device for a wearable computer. Of course, I don’t have a wearable computer yet, but the same concept could be used to quickly type on a smartphone without a keyboard (or with a cumbersome keyboard). I’ve been having a great time designing and testing so far though, and I’ve got more to do. All of it is exciting—the stuff I’ve completed as well as what I have left to do. I’m honestly surprised it took me this long to discover such a great bridge between two hobbies I enjoy so much. 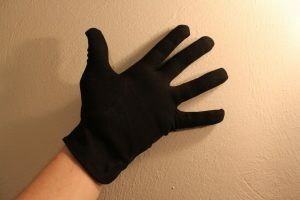 For anyone interested: I have migrated this project (and the related blog posts) over to its own website: http://www.keyglove.net. The rest of the keyglove hardware has arrived! Awesome! In case you have no idea what I’m talking about, my previous posts about the keyglove are here, here, and here. After I got the envelope open, I plugged the Arduino board in and, surpassing all expectations, had my prototype code running on it in about 10 seconds. It was literally that fast and easy. My code didn’t do much at the time and has required some changes, of course, but the interface couldn’t have been easier. I am very impressed with the board and the simple, effective development environment. Most importantly, the silver epoxy showed up, and I’ve been able to test it on the glove’s fingertips. It is remarkably conductive, and in that sense it is exactly what I was hoping for. However, it is a pain to work with because of the nature of epoxy, and it is relatively expensive. I only did two of the contact pads, and it’s reasonable to believe that I could have used the rest of the tube on just that one glove. Silver is over $21/oz right now, and combined with the extra properties and manufacturing costs of the epoxy, that adds a good $30 to the materials cost of any single glove, not to mention a lot more work. So, I’m going to try using adhesive copper foil tape instead (maybe with some regular epoxy to make sure it stays put). I don’t have any of it yet, but hopefully it will arrive in the next couple of days. In the mean time, I can work on my code and get it much closer to completion. I don’t think I’ll be able to get it to a true working state until after the PS/2 cable shows up and I can test the actual computer interface a bit. How that works will impact how I define the keycode constants. I want this thing to be customizable; the Arduino has 512 bytes of EEPROM memory which I should be able to use for persistent customization just such as this. The first of the keyglove prototype hardware I ordered has arrived! So far, it’s just the gloves and wire and a few tools; I still need the silver epoxy and Arduino board. I got two pairs of gloves in case I screwed one up, since they were so cheap. I’m wearing them right now (and will try to continue to do so until/unless they become annoying). I want to see how easy it is for me to do regular daily tasks while wearing them. Of course, there are a few reasons this “test run” isn’t quite realistic. First, I’m wearing two gloves right now, and for real usage, I’d really only be wearing one. 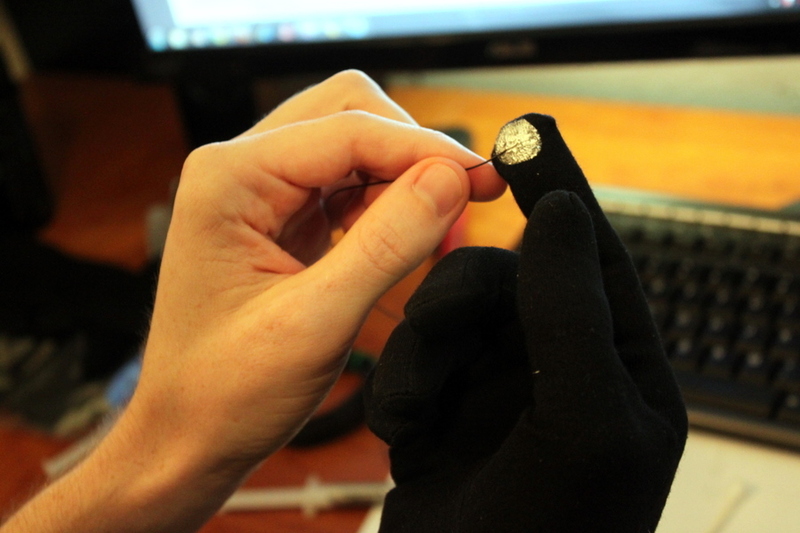 Second, these gloves don’t have any hardware on the back or, more importantly, conductive pads on the front anywhere. Certain things that make strong use of the fingertips (such as typing) won’t feel accurate yet. But even so, it’s an interesting experiment. The hardware should add a negligible amount of weight, and the conductive pads should hopefully be thin enough not to be very disruptive. Freedom of movement is almost unchanged. The gloves don’t feel restrictive by themselves. It is much more difficult to find “home row” by touch on a keyboard through the gloves. Having found home row, typing takes only a slightly larger amount of concentration than usual. The gloves are thin enough that they don’t create “fat-finger” typos accidentally. Using a regular mouse is exactly the same with or without the gloves, except there is almost no grip when picking it up. Using the Trackpoint (a.k.a. “nub” or “button” mouse) on my Thinkpad is not difficult. Using my capacitive phone touchscreen is not impossible, but it is very difficult. More to come later. I need to see if I can finish the Arduino code. After I wrote my last post (not before, as I probably should have done), I googled “keyglove” to see what would come up. As it turns out, there are actually a few separate designs that are in some way similar to what I wrote about. My idea was an original thought for me, but it seems there are others who have also had the same original thought. 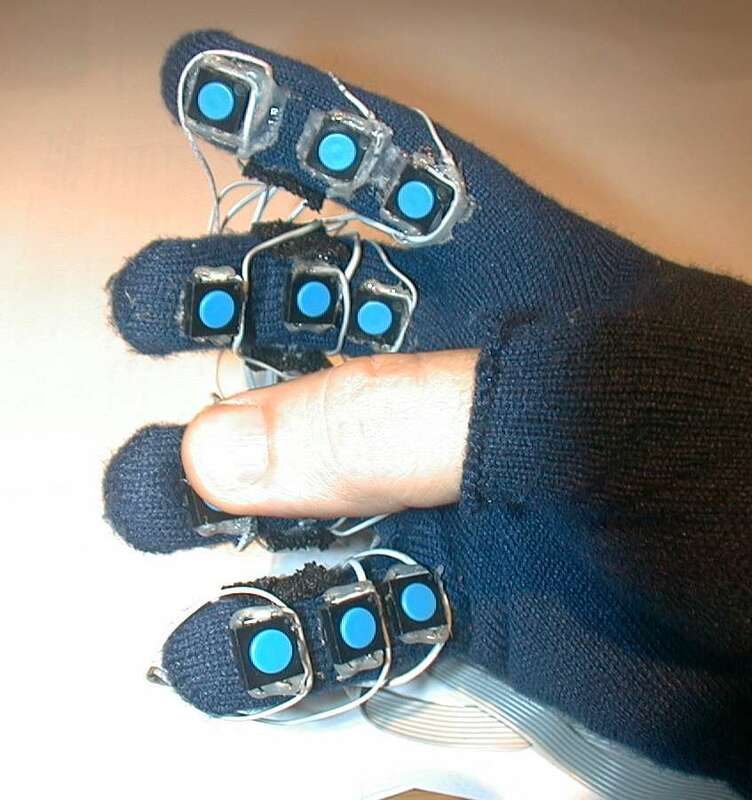 The least similar project is a 16-key wearable keyglove, which appears to be an early prototype that didn’t go very far. According to the article, it attempted to create all of the standard 101 keys of a full-size keyboard, but only succeeded in implementing 45 due to ergonomic constraints. 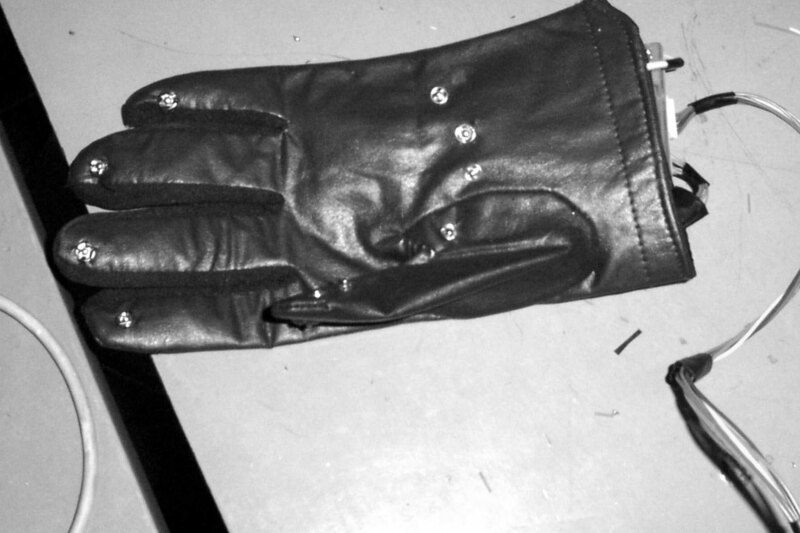 They also seem to be using leather gloves, which are more restrictive than I prefer. I am not sure of the actual year of design. The next attempt, on eyetap.org as a Key-Glove, looks incredibly similar to the physical design I imagined, but the implementation is a little different. They don’t make use of the palm area at all, at least in the default design, and they use 21 different sensors (made ingeniously from snap buttons) to achieve 8 * 13 = 104 possible 1-to-1 sensor combinations. The processor board is ripped from a standard 101-key keyboard though, so it is impossible to make use of multi-sensor combinations, and very difficult to customize once it’s built. The physical design is great though. The third keyglove, adapted from the one on eyetap.org, is over at wirejunkie.com. It’s closer in comfort to what I envisioned, but other than being an ergonomically refined version of the previous glove, it is very similar. It does make more use of keyboard remapping though. 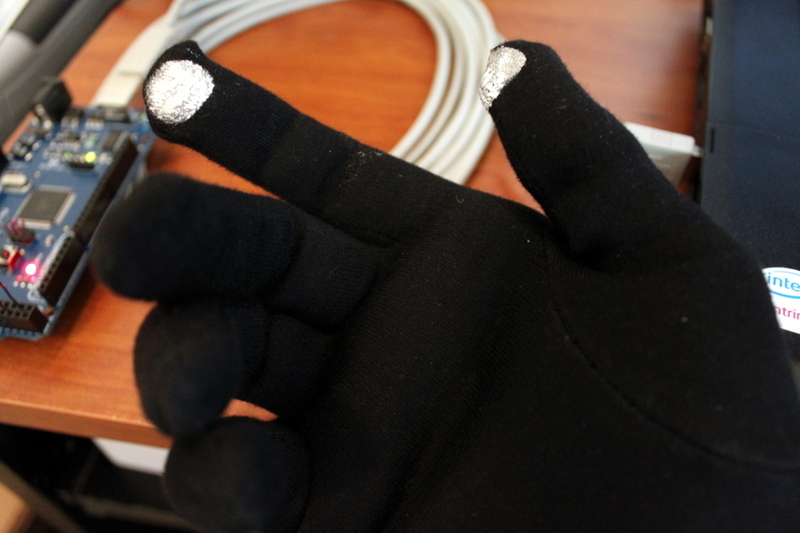 There is also the Thumbcode glove from Stanford. This is also close to what I had in mind, though the approach is different. 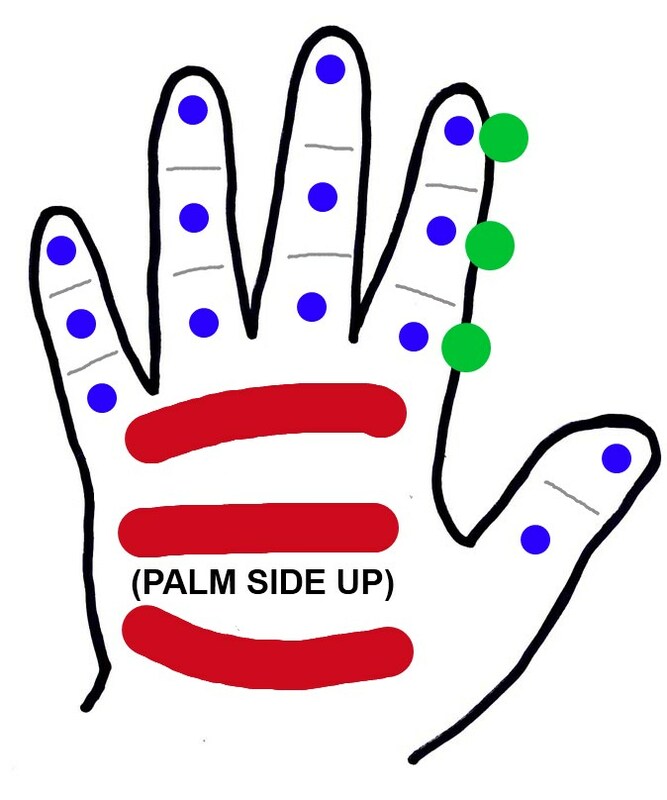 They have only buttons on the three segments of each of four fingers, and achieve multiple combinations by detecting which fingers are touching together. It is a very interesting glove. Finally, there is the KiTTY input device (kittytech.com). This is a unique kind of glove-like device which was originally designed for both hands and made to be easy for people who are already good at touch typing. It is not quite like any of the other above mentioned devices, but it is also not quite like what I had in mind. 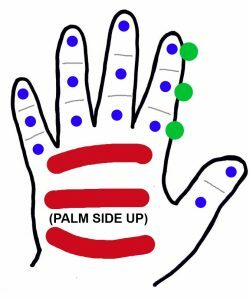 None of these designs take advantage of the relative ease with which the human hand can use two or more fingers to touch the same area on the same hand. They are also usually not easy to customize after building beyond OS-based keyboard remapping, and the sensors are quite small due to the hardware used (snap buttons, except in the case of the KiTTY). Additionally, two of the gloves were leather, which impedes other kind of precision activities (like writing or typing on a regular keyboard). The handbell glove is very comfortable and quite thin. 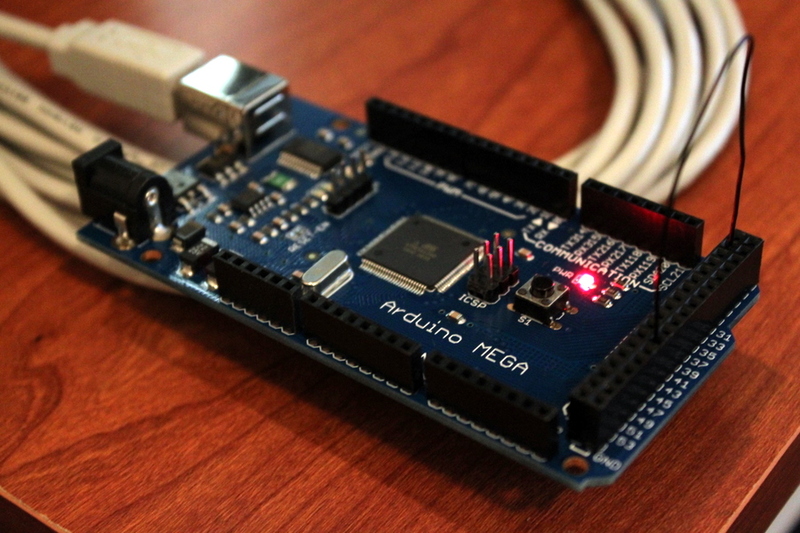 The Arduino Mega board looks awesome for prototyping; it’s too big for a finished product, but that’s not what it’s designed for. It should allow me to do about as much customization as I can think of. The silver epoxy is a gamble. It’s suppose to be highly conductive (volume resistance < 1 ohm), so my goal is to use it to create relatively large thin conductive pads on the glove in which I can simply set the wires and allow everything to dry. It might not work though, in which case I’ll probably have to try something metal. I’d rather use epoxy since it’s less potentially damaging to other surfaces. My glove sensor arrangement is shown on the right. I still need to finish mapping the sensor connection possibilities, and then take a shot at mapping the keys, and then I’ll be ready for hardware! This is exciting.